The shoulder joint is the most complex joint in the human body. It is tasked with giving you both the mobility to move your arm 360 degrees, as well as the stability that allows all the bones, muscles, tendons, and ligaments that make up the shoulder to work together. Closed chain exercises (i.e., keeping a hand/forearm/elbow on the floor). Open-chain exercises (i.e., functional movements that don’t require stabilising against the ground). 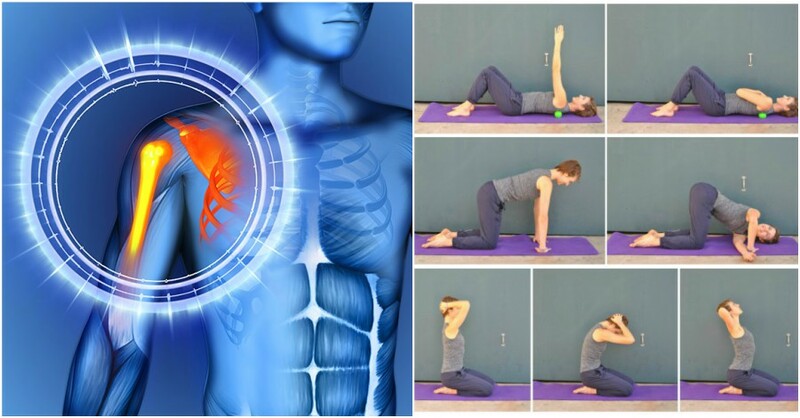 Fascial-release exercises (to release the connective tissue that surrounds the shoulder girdle and pecs). Start by lying on your stomach with your arms stretched out to the side in a letter “T” position. Keep the palms facing down. Bend the left elbow, and press the left palm next to the left side of the ribcage. As you roll the body towards the right hand, press into the left hand, bend the left knee, and take the foot to the outside of the right leg. Hold for 3 breaths, before gently releasing. Keep the elbows straight as you shrug your shoulder blades together. To push the shoulder blades apart, press more into the hands, towards the side of the ribs. Continue to shrug in and out for 15 repetitions. Start on hands and knees, with the fingers pointing in towards each other. Bend the right elbow as the left arm reaches under the body and across to the right side. The left shoulder and ear can relax down onto the floor (if your flexibility allows). Hold in this position for 5 breaths. Start by kneeling on the floor or sitting in a chair. Keep the arms down by the side, palms facing the hips. Sweep the right arm up overhead, the palm facing in towards the body. At the top, rotate the palm away from you. Continue to circle the arm back behind the shoulder (with the thumb pointing down) until you return to the starting position. Complete 5 circles forward and 5 circles back. Reach the right arm forward, directly in front of the chest (with the palm facing the left side). Reach through the right fingertips, so the right shoulder blade glides away from the spine. Keep the torso still, then glide the shoulder blade back in towards the spine. Continue to move the shoulder blade out and in for 5 repetitions. Relax the arm, then switch sides. Start by kneeling or sitting in a chair with the hands behind the head, and elbows straight out to the side. EXHALE, round the upper back, and relax the chin to the chest. Allow the elbows to drop down and in towards each other *. INHALE and lift the elbows, head, and chest. Continue to extend the upper back, and tuck the breastbone. The eyes gaze towards the ceiling. Continue to alternate between these two positions for 5 repetitions. Take a fascial-release ball or tennis ball. With gentle pressure, use your left hand to roll the ball against the right side of your chest and the front of the shoulder. Avoid rolling on the sternum (breast bone). Continue for 30 seconds before switching sides. Take a fascial-release ball or tennis ball, and place it behind your right shoulder (below the clavicle and above the scapula). Gently roll from side to side (against the ball) for 30 seconds. Remove the ball, and switch sides. Start by lying on your left side, with the knees bent and the left hand cradling the head. Keep the elbow reaching forward on the floor. Gently place a fascial-release ball or tennis ball under the side of the left shoulder (at the back of the armpit, in the teres minor and major muscle group). This exercise is very tender, so be gentle. Hold for 5-10 breaths, depending on the intensity. You can also do this exercise standing against a wall, with the ball between the wall and shoulder (which is a more gentle version).